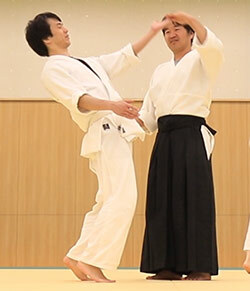 Meishinryu is new Aiki-Jujutsu of the combination budo of Daitoryu of Okamoto Seigo and Aikido of Steven Segal. It is the new style of Japanese budo, but having Aiki technique of Daitoryu, we are very close to Takeda Sokaku's Aiki Jujutsu. Toshi Asaka, the founder of Meishinryu Aiki-Jujutsu learned his Aikido under Haruo Matsuoka Sensei who is a direct student of Steven Segal and Aiki-jujutsu under Seigo Okamoto of Daitoryu Aiki-Jujutsu. After the years of training both masters, he decided to combine both Aikido and Daitoryu together and established a new style of Japanese Budo Style called "Meishinryu." Tenshokai is the name of the organization of Meishinryu in Japan. Our main Dojo is located in Yokohama, Kanagawa Prefecture, Japan. In Tenshokai, we have a class of Aiki and Aikido. Just like Okamoto Sensei of Daitoryu, the instructor will teach his Aiki techniques to all of his students with his own hands so that the students can feel directly "What is Aiki" with their bodies. That is the only and quickest way to learn Aiki. Because the instructor used to live in LA for 10 years, he speaks English. So, when he had international students in his Dojo, he speaks English to explain the fundamentals of each techniques. Meishinryu divides Aiki and Aikido as two different techniques. We categorize Aikido as Jujutsu technique because the techniques of Aikido are based on "Kuzushi (making opponent off-balanced)", joint locking techniques and throwing techniques. In Japanese term of those kinds of martial arts techniques are considered as "Jujutsu." If you learn the proper way of those locking and throwing technique with a continuous motion with the foot-works, you could be able to throw and lock anybody because the composition of the human body is the same. In Japanese, this is called "Jujutsu." However, Aikido is not just a technique of "Jujutsu." Aikido also has the beautiful concept of "The Way of The Harmony." In Meishinryu, the philosophy of Budo (the way of martial art) takes the same principle of Aikido that is making friends and bringing harmony in the community. That is "Aiki" in Aikido. We considered as this philosophy of Aikido is the most important thing by learning Meishinryu Aiki-Jujutsu. Meishinryu trains Aiki as the technique of Daitoryu Aiki-Jujutsu. Unlike Aikido that considers "Aiki" as the philosophy of "the way of the harmony," Aiki in Daitoryu is the actual combat technique. Most of the world think Aiki is the secret skill that only true masters can reach and use. However, in Meishinryu, Aiki is just a technique that if you train properly, anyone can learn and use it. When you see the video clips of masters that are throwing people by only touching or sometimes they are not even touching, you think they are fake or Uke are just taking Ukemi. People would say that is a fantasy from the legend of Japanese martial arts. However, you will surprise when you actually feel and being thrown by Aiki, and the first word you would say is "I can't believe it and I don't get it." That is exactly what the founder felt when he was thrown by Okamoto Sensei, the master of Daitoryu. So, you don't believe it when you see it, but you've got to believe it when you receive the power of Aiki. In Meishinryu, the founder had already figured out how and why "Aiki" work as the combat skills according to all scientific functions and logic. So, we train Aiki not based on the feeling of the masters that most of the times so hard to understand, but we practice with fully understand the logic of Aiki. This prevents to going wrong directions of Aiki and confusing of understanding Aiki. Meishinryu has a clear method to learn Aiki so that anyone can accomplish to gain the technique of Aiki. Also, please feel free to contact Toshi Asaka for inviting the instructor to your country or location to have a seminar or any international relationship with Meishinryu Aiki-Jujutsu Tenshokai.